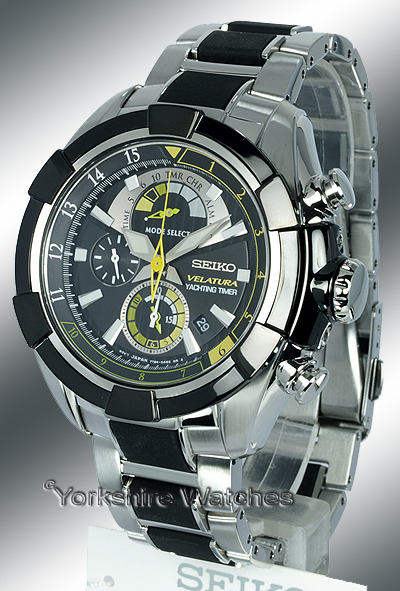 The Seiko company was founded in 1881, when Kintarō Hattori opened a watch and jewelry shop in Tokyo. 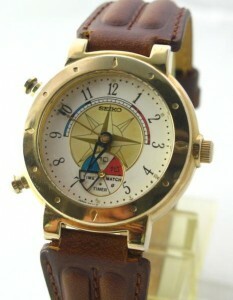 Eleven years later, in 1892, he founded the company Seikosha Co, where initially wall clocks were produced. Soon they were followed by pocket watches and watches with an alarm function. 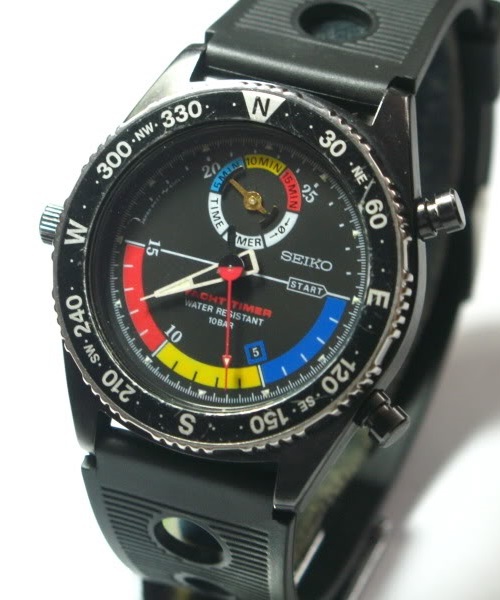 In 1913 Seiko (which means ‘precision’ in Japanese) manufactured its first wristwatch, and today the brand is well known for its inventions over the years. Already in 1958 Seiko started with the developement of quartz movements, which let to the first commercial quartz wristwatch of the world in 1969, the Seiko Quartz Astron. 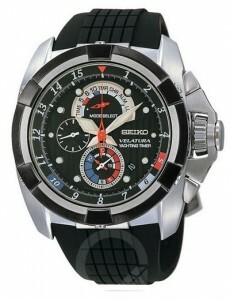 Seiko’s tradition in sports timing started at the 1964 Olympic Games in Tokyo, where they served as Official Timekeeper. Ever since the brand has been involved in many sports events, eg athletics, football and sailing. Probably beginning 1990’s the regatta caliber 8M35 was developed, with an adjustable countdown timer from 1 to 30 minutes, as well as preset timers for 5, 10 and 15 minutes. Various Seiko models with a quartz 8M35 regatta movement. Model: Seiko Yacht Timer Sports 150 , several versions. Reference: many, eg SEQ 003 (most right picture). 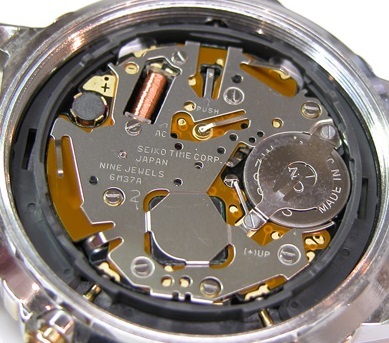 Caliber: Seiko 8M35-800A quartz movement. Case size: Ø 39 mm. Year: 1990’s, third picture from the 1990 Sport-tech series. You can download the operating instructions for the caliber 8M35 here. 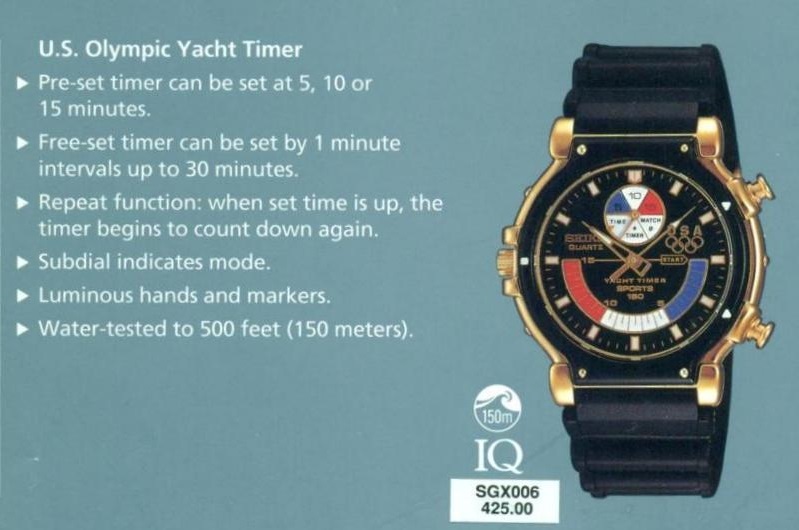 Seiko U.S. Olympic Yacht Timer, 1992. 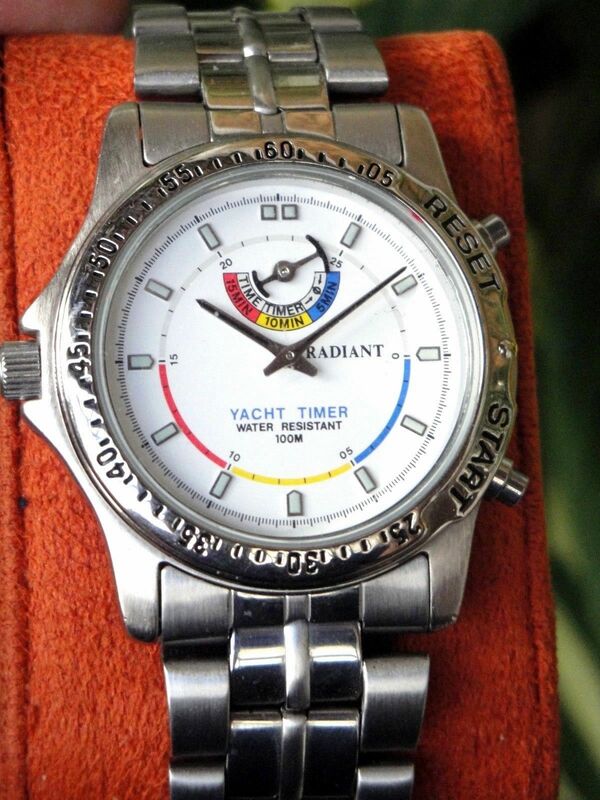 Radiant Yacht Timer, ref. 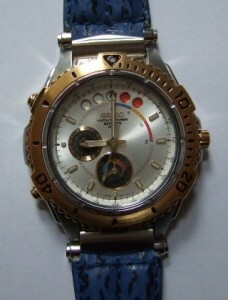 TUH996PM, most likely with a Seiko 8M35 movement. 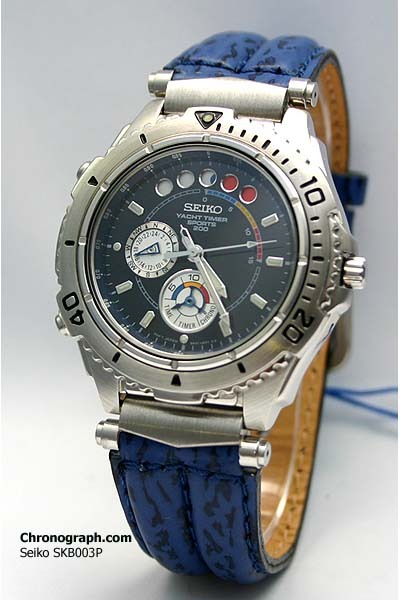 In 1995 Seiko introduced the Yacht Timer Sports 200 models, as part of The Great Blue series. Inspired by the older mechanical movements, Seiko developed the first quartz movement with the 5-dot countdown system, caliber 6M37-6010. 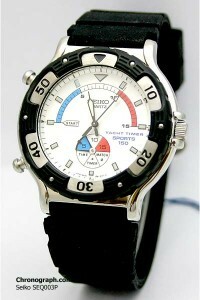 Seiko Yacht Timer Sports 200 with black or silver dial. Model: Seiko Yacht Timer Sports 200.
silver dial and blue leather strap. Caliber: Seiko 6M37-6010 quartz movement. Case size: Ø 42 mm / H 12 mm. In the operating manual you can read how the countdown system works, click here to download the English version. 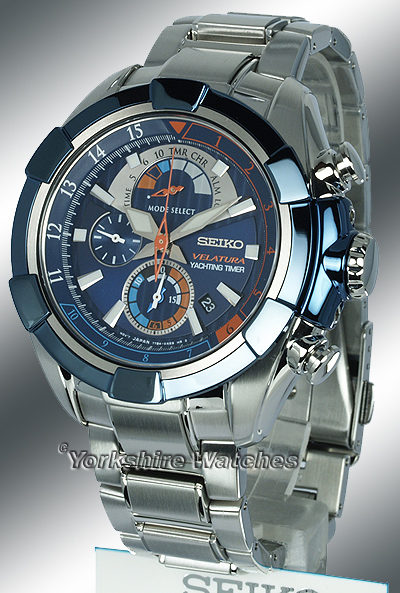 At Baselworld 2007, Seiko launched a new marine collection, the Velatura. The collection included two new calibers, one of them the Yachting Timer caliber 7T84. Seiko Velatura Yachting Timer, SPC005P1 and SPC007P1. Seiko Velatura Yachting Timer, SPC041P1 and SPC049P1. 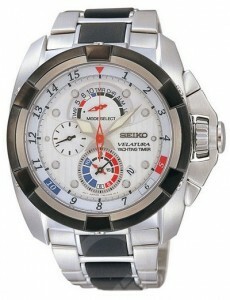 Model: Seiko Velatura Yachting Timer. 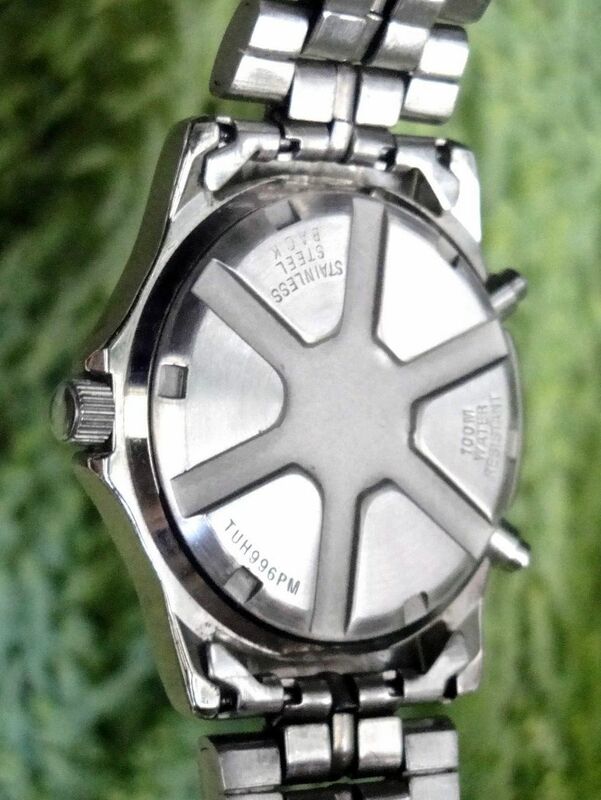 Reference: SPC005P1 silver dial with steel bracelet. SPC007P1 black dial with black rubber strap. SPC041P1 black dial with Brown leather strap. SPC049P1 titanium case with leather/nylon strap. Caliber: Seiko analogue quartz 7T84 movement. Case size: Ø 44 mm / H 12 mm. Year: since 2008 upto 2012(?). You can download the instruction manual of caliber 7T84 here, and learn how the regatta countdown system works. With the launch of the Velatura series in 2007, Seiko rose to the challenge to build watches that perform on the open ocean, with a collection characterized by robustness, high functionality and durability. 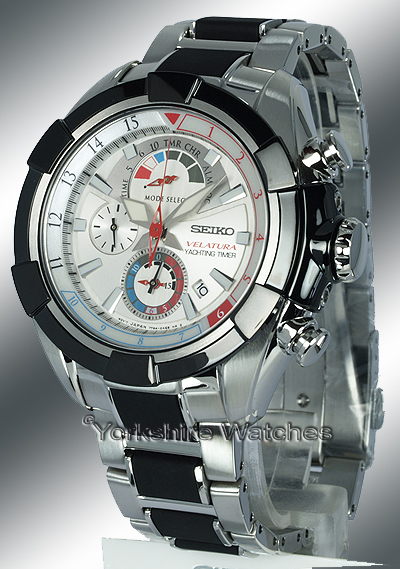 Also in 2007, Seiko was selected as the Watch Partner of the International 49er Class Association. 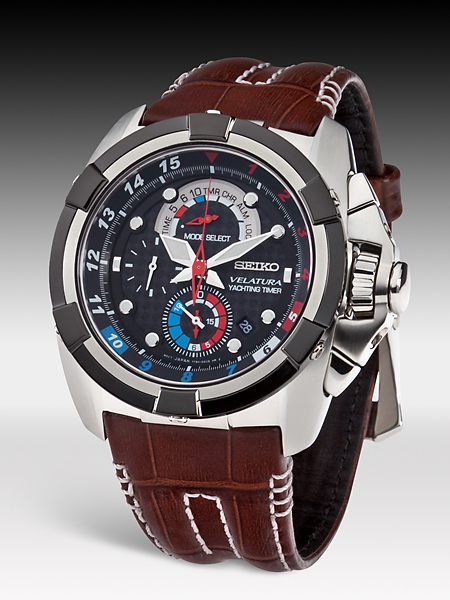 To mark the fourth year of their partnership, Seiko launced a new model in the Velatura collection, a standard chronograph housing with the caliber 7T62 Alarm movement. 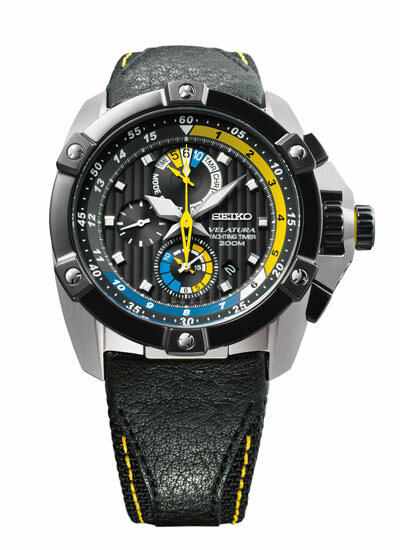 Not with a special countdown function, but with a coloured 5-10-15 minutes subdial. The watch is available with either a stainless steel case with black hard coating and a polyurethane strap (ref. SNAE17) or a stainless steel case with blue hard coating and a stainless steel bracelet with three-fold slasp (ref. SNAE19). Seiko Velatura Yachting Timer: SPC143P1, SPC145P1, SPC147P1 and SPC149P1. SPC143P1 brushed and polished stainless steel case and bracelet – fixed blue bezel – blue dial. SPC145P1 brushed and polished stainless steel case and bracelet with rubber centre links – fixed black bezel – silver dial. 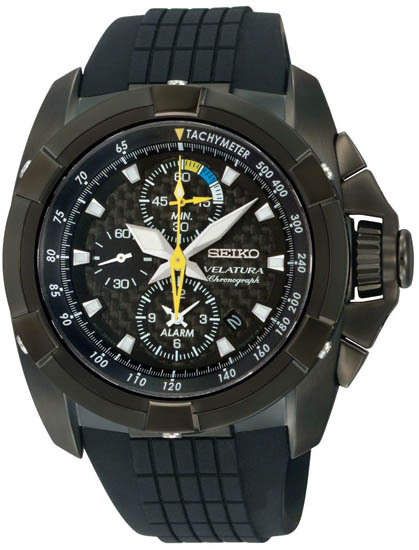 SPC147P1 brushed and polished stainless steel case and bracelet with rubber centre links – fixed black bezel – black dial. SPC149P1 brushed and polished ion black stainless steel case with black silicone rubber strap – fixed black bezel – black textured dial. Caliber: Analogue quartz 7T84 movement. Case size: Ø 44 mm / H 11 mm. many thanks to Robert Mahoney for the English version of the caliber 6M37 operating manual. 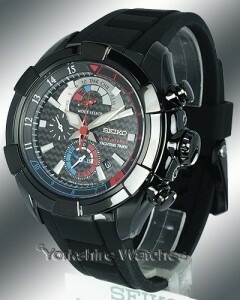 many thanks to Yorkshire Watches (http://www.yorkshirewatches.co.uk/) for using your pictures.